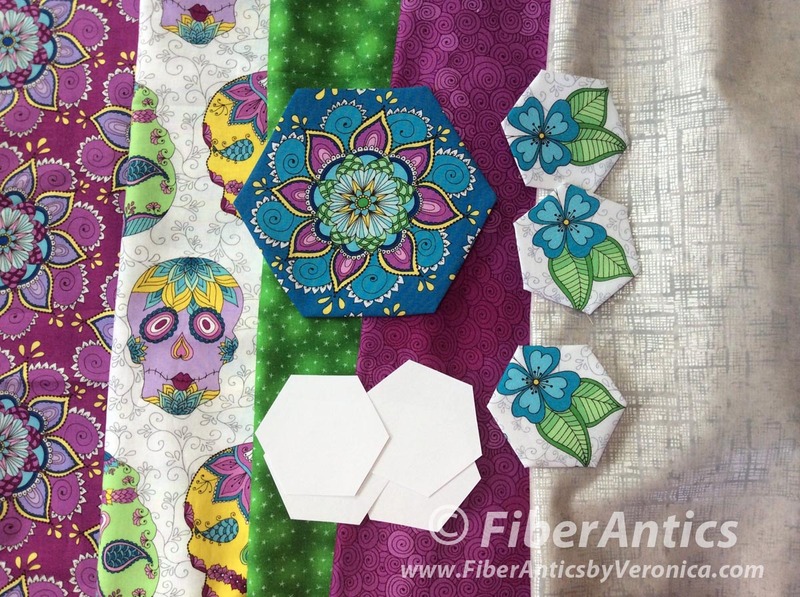 For the last month, I've been experimenting with a different kind of embellishment for quilts and quilted items. I'm studying a new technique (and learning a lot! ), but I don't feel I have a solid foundation just yet to put it out into the world. For the next quilt study in the series, I've chosen fabrics from the recently released Day of the Dragonfly fabric collection by Kristin Omdahl for Blank Quilting and added a couple basics (Starlet and Pearl Grid) to the mix. with Starlet and Pearl Grid blenders. If you're a crocheter or knitter, you probably know Kristin Omdahl—through her books, patterns, yarns, TV shows or maybe taken a class with her. She's been a professional in the yarn world for quite a long time. If you're not a "yarny," here's the back story about how I met up with Kristin and how the seed was planted that lead to this fabric line. The back story: Two years ago, I was returning from AQS QuiltWeek in Paducah, KY and popped in at the Stitches South knit and crochet convention in Nashville, TN. Flying through the vendor mall (the show was closing in about 3 hours), I stopped at a booth that had tote bags for knitters/crocheters to keep their projects in. The fabric that was used for the bags had delightful designs done in a carefree, painterly style. Being a fabric representative, I was curious to know whose fabric line it was. When I asked, the woman in the booth told me Kristin Omdahl had designed the fabrics and was printing them [digitally] in small quantities to make and also sell the bags. Long story short, I introduced myself to Kristin and when I told her who I was, what I did, and asked about her designs, her eyes welled up and she hugged me. A dream of hers could possibly come true... to design a line of fabric for a major fabric company. I forwarded Kristin's name, a short bio and a summary of our conversation to the lead stylist in the design department at Blank Quilting. A few months later, Kristin was contacted and the Day of the Dragonfly fabric collection was born. Here is Kristin's blog post about the concept for the line. 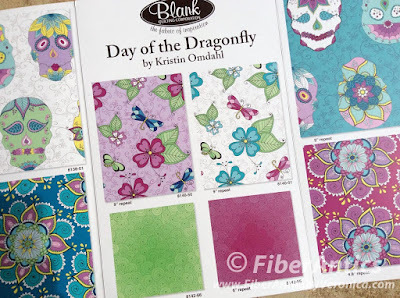 Day of the Dragonfly fabric collection by Kristin Omdahl for Blank Quilting. 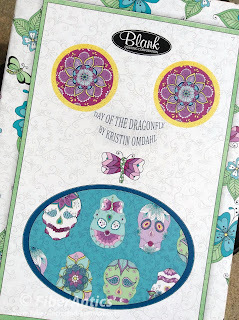 In the Day of the Dragonfly collection, I was drawn to the red-violet and turquoise tertiary color palette with the bright yellow and chartreuse accents. Also, the lively, stylized flowers and swirls are happy and fun. Being married to a Grateful Dead aficionado (a deadhead), the sugar skulls and similar skeleton designs are common motifs around our house. This next quilt study is on the design wall. It will incorporate Kristin's fabric line, English paper pieced hexagons [slow stitching] and free-motion machine quilting techniques [fast stitching] with a new embellishing technique (that is still percolating in my brain).